Over the course of the last two decades, genetically-engineered (biotech, GMO) agricultural products (crops), including foodstuffs and cotton, have slowly but surely increased by any measures: acreage planted and harvested, fraction of our food supplies containing them, etc. 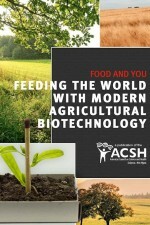 (See ACSH s recent publications for relevant details, both scientific and quantitative). Farmers have avidly taken up these technologies, where they are not prohibited by scientifically-illiterate or activist-cowed politicians and regulators, and the benefits to both planters/harvesters and to all food consumers (ie, everyone) are manifest by their market dominance. These include both economic benefits and health benefits as well. One food crop not available: wheat. The staff of life has been absent from the vibrant development of other GMO crops. Since wheat comprises about one-fifth of the caloric intake of mankind, the lack of more efficiently-grown wheat has been (and promises to be for the foreseeable future) a major downside in the field of improving nutrition for the many malnourished in the third world. There is no reason on earth why this situation should exist, and none either why it is still tolerated or even embraced by agricultural-chemical and biotech companies, who if simple human benefit and economics were to hold sway should be plowing full-force (pun intended) into getting biotech wheat out onto the market. In fact, it is nothing other than activist, anti-science-induced fear-mongering and superstition that is standing in the way. Given the key role that wheat, meaning bread, the staff of life, plays in human culture and even religion, anti-technology activists and politicians find it easy to exploit consumer fears about meddling with nature when it comes to manipulating wheat s genome in any way. Maybe this is about to change: a consortium/coalition of sixteen farm and wheat organizations in Australia, Canada and the United States last week publicly reaffirmed support for innovation in wheat, including the future commercialization of biotechnology. To solidify their stance, the groups signed a joint statement replacing an original document signed five years ago which details shared commitments for the "responsible advancement of biotech traits and other breeding advancements in wheat." The groups signing on include the American Farm Bureau Federation and the National Farmers Union, and also the National Association of Wheat Growers, North American Millers' Association, and U.S. Wheat Associates. In the statement, signatories call for further innovation in research. Currently, wheat represents about 20% of human calorie intake, making it an essential part of the global diet and critical to food security. As demand increases, the statement says, wheat supplies must remain abundant while meeting the highest quality and nutrition standards. According to the groups, advanced breeding and biotechnology will help protect the continued availability of wheat foods and "ultimately offers the promise of improved products, more sustainable production and environmental benefits." ACSH s Dr. Gil Ross had this comment: Like Golden Rice , which has the potential to avert mass sickness and premature death from vitamin A deficiency among impoverished Asians, the lack of biotech wheat is a major contributor to malnutrition in many parts of the world. The anti-biotech groups who prey upon consumer- and media-fears of frankenfoods care naught for this suffering, as they have never experienced a single day of hunger, much less watched their infants suffer and die of this needless curse. They should be ashamed, but the companies whose research and development of GM-wheat are in abeyance should also confront these zealots, not kowtow to them, and the sooner the better.